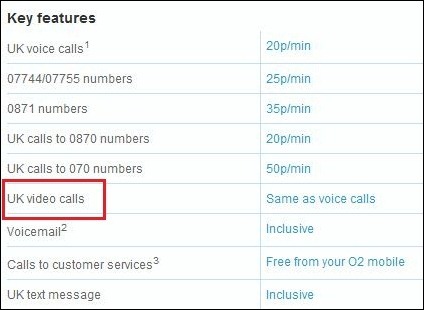 The updated O2 UK iPhone plans has added “video calls” in their list of “Key Features”, hence strongly suggesting that the next-gen iPhone will support video conferencing of some sort come this June. The said option can be seen in the screenshot below, or on the O2 UK site here. We already know that Apple has laid the foundation for video calling in the latest iPhone 3.2 SDK for iPad. This has been repeatedly confirmed by devs that iPhone OS 3.2 contains rudimentary support for video calling. Next-gen iPhone is likely to be unveiled at this year’s WWDC conference. It is expected to feature a faster processor, a 5 megapixel camera with LED flash, support for WiFi-N standard and so on. Woo-hoo. iPhone features are gradually catching up with that SonyEricsson phone I had a few years ago. Ahhh the rumour wagon. Last year it was 'finally the iPhone will be getting video calling and an LED flash, and an OLED screen…' – look what happened! What's this about o2 feeling more confident about their network by adding a price for video calling? I was having video conferences on my old Nokia N81 THREE YEARS AGO without any problems. O2 have the biggest data stream out of any service in the UK, because they're mounted onto BT Cellnet's old infrastructure. It was a typo and has now been removed. They simply copied one of their existing tariffs for phones that do video calls and forget to fix it. I can belive all these rumours of the Iphone been going around, i know an iphone will come out but will they eva sort the bluetooth problem as on the iphone u cant bluetooth other phones music and pics and this was a major problems, may be apples doesnt want people to use other services, this was a major failure and i went on holiday and took pics on my iphone 3gs and could not send or recive songs and pics wat a disapointment compared to other handsets jus shows to go that not all handsets can do everything, which did the bluetooth feature if u cant even use it, kinda put me off apple.